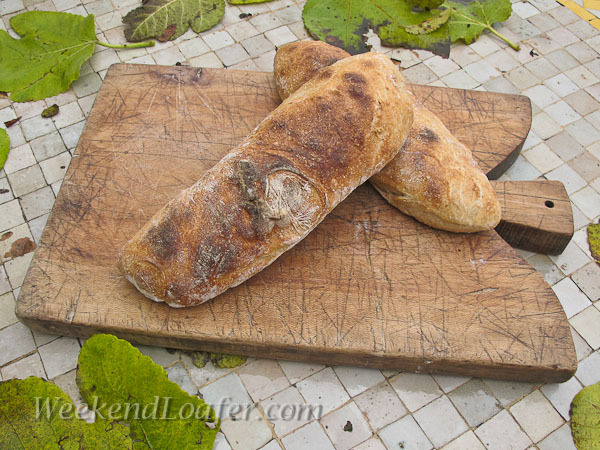 Now I think it’s time to roll up my sleeves and dive into this rustic Bougnat from Daniel Leader’s Local Breads. This is another bread from the prestigious Meilleur Ouvrier de France award winner Pierre Nury who hails from the Auvergne region of France. The only characteristics of this bread that actually resembles a French style, is the stiff levain that is used — and, of course, its award winner baker! All the other nuances I have gotten accustomed to in making French bread, the tight shaping, timing of the rises, scoring of the loaves… have been thrown out the window. 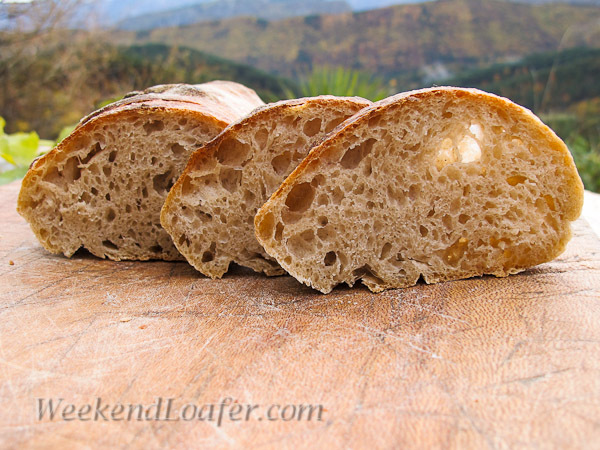 I have to admit to being a little intimidated when reading the description of this French rustic rye, a loaf that looks quite a bit like Italian ciabatta…especially the author’s caveat that “the high proportion of water in this dough makes it difficult to knead by hand.” But I was not going to let a little wet dough scare me off. It actually felt good to get loose, and play with some slack dough! While things are being turned upside down with this recipe, I might as well throw something else into the mix (no pun intended) and continue my experimentation with the autolyse process. Until now I have not been adding the levain to the initial mix of the flour and water. After reading Teresa’s second experiment in the autolyse process, I thought it could only give the dough a better structure, stronger development and maybe make it easier to incorporate the stiff levain into such wet dough. The hand mixing was a little sloppy to start…but after a short time the dough developed into a silky, smooth wet dough…and passed the window pane test with flying colors. The rest of the process went along smoothly with no other real predicaments… so after a couple of folds and a rise, it went into the regenerator for its long, slow overnight ferment. The next day I was eager to see what became of the dough… but I thought I’d give it the full twelve hours before I looked in. So, the hour approached, the timer went off for the moment of truth and I opened the refrigerator; I could not believe my eyes! The once little boule…had more than quadrupled in size, had reached the top of the bowl and was filled with lots of big gas bubbles. I gently turned out the dough, divided it and slipped it into the hot steamy oven. I really thought I had hit this one on the head! But this was not to be the case. The bread had a great creamy crumb, a subtle, slightly sour rye taste, a chewy crumb with a nice mouth feel and crackling crust … but where were those “long glossy tunnels” described by the author? I am not really sure what happened to all the gas pocket so evident when I turned it out…was the gluten structure not developed enough?…was it over proofed?… was it the Type 130 rye flour that I used?…. or maybe the Type 65 with its gluten additive was not strong enough to hold the gas? I have a sneaking suspicion that it was the coarse, heavy rye flour might have cut the glutens and causing the “long glossy tunnels” to collapse. The jury is still out on this one. If you made it through to the end of this post…congratulations and thanks for reading! Now…seriously…Do you have any ideas on who stole my bubbles? Please leave me a comment. I would be very interested to hear your thoughts. and - even if you are missing some bubbles, it still looks good! I would guess overproofing might be the culprit if it did a quad in the fridge. What gets me about this bread is that, after making it with a stiff rye starter, medium and whole rye at the amounts specified, I taste no rye in the bread at all. I want to taste the rye since I like it so but no, its not there. MC's Pain Levain "a la Gerard"
Dear Santa....there is some kind of mistake!!! !